In One Year Later, we look back at the most hyped and heavily discussed movie of this month one year ago, consider its reception at that time, and examine how it holds up today, free of expectations. The hype around a new release from Walt Disney Animation Studios invariably involves the past, both recent and distant. Each new entry has to reckon with a long list of predecessors that includes more than a few classics, a legacy that stretches back all the way to Snow White And The Seven Dwarfs, the first animated feature. More recently, Disney’s animated offerings have been measured against a renaissance that stretches back to the ascension of Pixar’s John Lasseter to Walt Disney Feature Animation’s chief creative officer when Disney’s purchased Pixar in 2006. That renaissance kicked into full swing with the 2010 feature Tangled, an adaptation of the Rapunzel story that put a 21st-century spin on Disney’s classic fairy-tale adaptations—particularly the company’s much-merchandised princess films. Combining self-aware humor, spirited wit, a confident heroine, solid songs from Alan Menken and Glenn Slater, and computer animation, Tangled seemed at once fresh and familiar. Otherwise, the pre-release attention mostly focused on the creative team behind the film. Wreck-It Ralph writer Jennifer Lee both wrote the screenplay and joined Disney vet Chris Buck as co-director, while the songs came from the new-to-Disney husband-and-wife team of Robert Lopez and Kristen Anderson-Lopez. Lino DiSalvo, the film’s head of animation, got dinged for some ill-chosen comments about women being hard to animate, but that controversy had largely blown over by the film’s release. When it hit theaters, Frozen received strong but less-than-rapturous reviews from most critics, the consensus leaning toward a sense the studio had made another solid, if not exactly game-changing animated feature. It seemed likely to become a holiday hit that, like Tangled, would have a long life on home-video and as a source for tie-in products, but hardly the phenomenon it became. Then it became a phenomenon. The short answer to “What holds up?” is that Frozen as a whole has held up well beyond what most could have imagined a year ago. The film has enjoyed such a remarkably long life that it practically still seems like a new release. Holiday-season store shelves practically buckle under the weight of Frozen merchandise. A recent New York Times article surveys a world of spin-offs that included everything from Frozen-branded fruit and juice to tours of the Norwegian locations that inspired the film. But savvy merchandising alone doesn’t explain the film’s connection with audiences, particularly kids, which has exceeded even Disney’s expectations, as evidenced by an early-2014 shortage of Frozen toys and dresses. Kids don’t want to buy what they don’t love. And kids love Frozen. 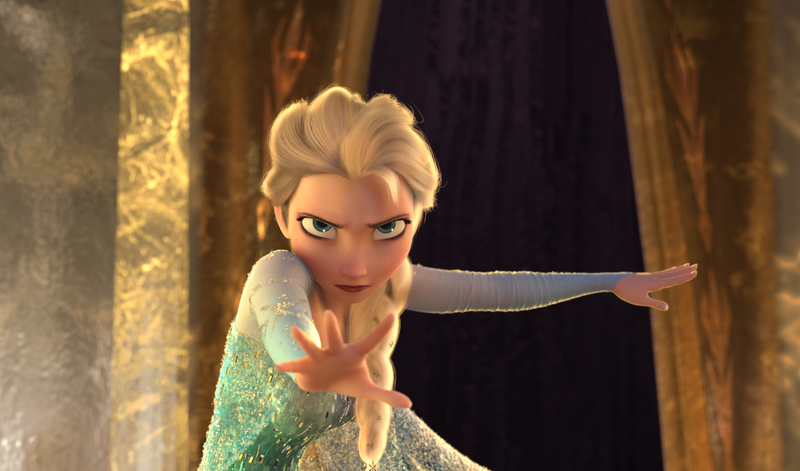 Those last two provide another reason for Frozen’s success: The film goes even further in eschewing the handsome-hero-rescues-princess storyline to focus on the relationship between the high-spirited Anna (Kristen Bell) and her older sister Elsa (Idina Menzel), whose fear of losing control of her magical ability to manipulate cold weather turns her into a recluse early in the film. The two have a complicated relationship that doesn’t resolve itself until a climax in which their sisterly bond saves the day. The film’s male characters run the gamut from villainous to heroically helpful, and though they push the plot along, they never supplant Anna and Elsa as the film’s center. It was a new type of story for Disney. Even if Mayim Bialik missed the point, others didn’t. That Anna and Elsa are such winning characters doesn’t hurt either. Bell and the animators invest Anna with a playful, winning spirit and keep her smart and brave while also letting her make some serious mistakes along the way. But it’s the vagueness of Elsa’s supernatural powers, and the way she and others respond to them, that gives the film its most intriguing element. Elsa’s not sure if she’s been gifted or cursed, and she follows her parents’ instructions to keep her powers hidden from the world, until the ecstatic “Let It Go” sequence, in which she uses them to make one beautiful, crystalline creation after another. It plays beautifully as a coming-out number, as some have read it, but it’s open to other interpretations as well. As with Marvel’s X-Men, what makes Elsa special also makes her suspect to some. She can be a stand-in for any kid not quite comfortable in his or her own skin for whatever reason. Kids get told to be themselves all the time. Elsa actually embodies the beauty of that sentiment. More problematic is the film’s big twist. The seemingly heroic Hans’ late-film heel turn sets up a the beautiful scene in which Elsa rescues Anna through an act that pushes the definition of true love away from romantic love. But what plays as shocking the first time through the film feels a bit like a cheat on subsequent viewings. Frozen gives no early indication that Hans isn’t what he seems, and it feels a bit unfair to have him turn villainous with no warning. Anna inhabits a comedy of manners in the film’s opening section, but Jane Austen wouldn’t approve of such reckless characterization. At this point it feels like the final verdict on this film is already in: Frozen’s not going away, ever. That’s not to say the yearlong Frozen frenzy won’t taper off, but it’s already established itself as the ’10s equivalent of The Little Mermaid or Beauty And The Beast, the sort of film that confirms the Disney machine is once again operating at full power. And like the films of the late-1980s/early-1990s Disney renaissance, Frozen is the sort of movie that isn’t just embraced by young viewers, it gets under their skin. The last entry in this column worried that Gravity might fall into obscurity, so dependent was its impact on seeing it on the big screen, ideally the biggest screen possible. Frozen works beautifully as a cinematic experience, but it’s also quite portable, the sort of movie kids can pop in repeatedly at home or watch on an iPad during long car rides. 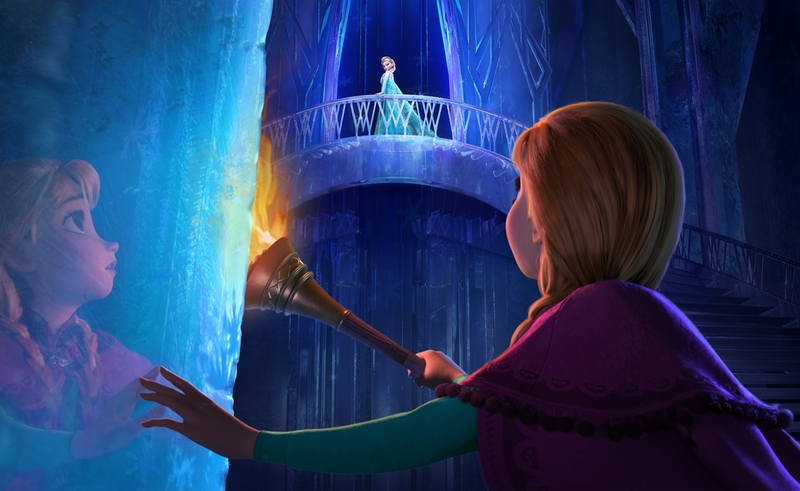 With its lush production design, the film turns the kingdom of Arendelle and its snow-covered surrounding environs into the sort of place kids love to revisit. But let’s leave the kids out of this for a minute. They may be the biggest reason for Frozen’s success, but they’re not the entire reason, nor are they the reason for its likely longevity. Frozen also works because it’s a type of film that now seems possible only in animation: an original, feature-length movie musical. Bigger-than-life emotions find a natural home in musicals, and Frozen makes every emotion bigger than life, from infatuation to rapture to the melancholy yearning of “Do You Want To Build A Snowman?” Its popularity speaks to a hunger for movies that traffic in those sorts of high emotion. Film can be a restrained, subtle medium, but it doesn’t have to be, and often shouldn’t be. Frozen gets that. It’s witty without being snarky and ecstatic without seeming excessive. The film also has an all-ages appeal in the best possible sense. It speaks to grown-ups and kids, and will almost certainly continue speaking to kids even after the hypnotic grip it’s now exerting over an entire generation loosens. It’s there for kids now and, like the best Disney films, it’ll still be there for them when they get older, ready to pass on to their own kids. It’s built to last whatever the weather.